I remarked to my kids when I heard about the strike action currently occurring in my children's school district. 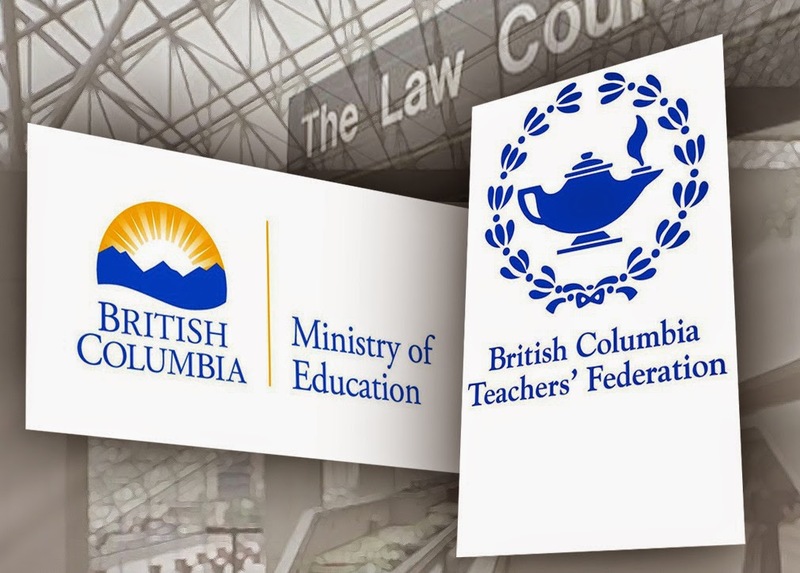 Although it is a partial strike, news of another dispute between the provincial government of British Columbia and the BC Teachers Federation strikes helplessness in the hearts and minds of many parents. Is there no end to it all? How long must British Columbians tolerate the annual bickering between the Government and the Teachers Union? What must be done to pacify the warring parties? Who speaks up for the parents? Is the fight really for children? "It's all about the kids, class sizes, and special education programs," some union leaders say. "No, it's simply about unreasonable demands," some government negotiators say. For many people, these are but veiled attempts to ask for / give out more money, both ways. I told my kids that in the initial years, I supported teachers without hesitation. Now, as I see the strikes increasingly becoming an annual affair, I think the problem is far deeper than merely two parties trying to strike (no pun intended) an agreement. It is about two highly distrusting parties that see each attempt from a cynical eye. The entire system is broken and as a result, both parties are unable to negotiate in trust and good faith. These two essential ingredients have become as rare as penguins swimming along the West coast. As negotiators try to trash out the issues, parents bear the brunt of the standoff. Strikes render them pretty much helpless. What if the government gets their end of the bargain but teachers remain unhappy and extremely de-motivated? This does not auger well for students. What if the teachers get what they want, the government passes down the buck and raises taxes for all? Parents and all residents will be unhappy. Comments to news reports have been increasingly abrasive and negative, on both sides. The whole situation shows the ugly sides of both government and teachers. It is very frustrating for parents; and very amusing to an increasingly cynical public at large. A broken system with multiple parties bickering about each other is never going to be fixed anytime soon. Now another group has entered the fray. Latest news is that students themselves are planning a walkout this coming Wednesday. They too want to make their own stand. So much for leading by example; dear teachers. Is that what you want to see, O Government? What can Christians make of all these? What stand should a Christian take, assuming they need to take a stand in the first place? What if the politician is Christian? Will that sway one’s opinion toward them? What if the Christian knows that many teachers are also Christians? Will that also tilt the support in the teachers’ favour? Let me share three do-not's and three do's. Let not the label “Christian” decide your vote. This means, just because you see individuals in whatever camp who go to Church, or are Christians, that you automatically cast a vote for them without thinking through the issues involved. For there are people who call themselves “Christian” but behave very unChristlike. There are also those who do not explicitly call themselves a Christian but behave in a manner that honours Christ. What this means is that, the label "Christian" is not a catch-all for wisdom and rightness. While I am sympathethic to people of the same faith, I must take on the stand of the law of the land. Wisdom is not only present in the domain of Christians. Non-Christians are known to be wise as well. Think of Gandhi. Things are never so clear cut that one is always right while the other is wrong. Both are right on some matters; but also wrong on others. There is no perfect party. So why behave in such a way as to insist on perfection by all? My argument is that, Christians must not take sides. If they must take side, take the side of people. People who have the very basic right to life and fair living. Do not blame the teachers for their decision to strike. For their concerns are real. With increasing class sizes, and wages that fail to keep up with the high cost of living, it is only fair for them to campaign for a fairer treatment. At the same time, the provincial government has her hands tied as well. How do they balance the bigger budget for the entire province? What if by giving teachers everything they want, other unions start insisting on higher claims of their own? How do they make it as equitable as possible not just to teachers but to other sectors of the economy? These are tough things, even for a government empowered to solve these issues. When the stakes are high and the tempers are flaring, it is easy to shout out names, with people being forced to take sides. Teachers and government leaders will be trying to garner support for their causes. It is easy to judge, but having done so, it would be even harder to take back one's judgment. Replace the desire to judge with a capacity to want to understand the issues. Try to empathize with both parties. Try to think through the issue fairly without calling anyone names or putting words into the mouths of their spokespersons. Let me offer three things that Christians can do, according to 1 Timothy 2:1-4. First, they can pray. Some Christians have often used this passage to justify praying for leaders first. While that is a good application, it fails to take note of a small detail. Read 1 Timothy 2:1 closely. "1I urge, then, first of all, that petitions, prayers, intercession and thanksgiving be made for all people—"
The prayers are to be made not for leaders first, but for all people. Do not be too quick to lift up the kings and leaders first. Lift up the people first to God, for God so loved the world that He gave His Son to all people. This means the young and the old; the rich or the poor; the healthy and the sick; and people from all walks of life. In our teachers dispute, it means praying as follows. For the government to be wise and fair in their dealings not just with teachers but also with the other sectors they are responsible in. For students to be wise, and not to meddle in adult matters, and to take on work that they are called to do: Be students. For public to be wise, not to be too simplistic in their criticisms of either party. Things are not as simple as the news media made them to be. Second, they can seek to understand the positions as fairly as possible. Mispresentation of any party will be very unhelpful. After all, many teachers and government leaders have children of their own in the public school system, so all of them have a vested interest to make things work. Give them the time to work things out. Create space so that negotiations can be done in good faith. That also means that if the media mis-reports anything, take the particular media to task. In order to pray specifically for the people involved, we need more specific information. Read widely on the topic. Seek balanced perspectives. Do not gravitate to news that reduce any one position unfairly. Third, support leaders who exercise wisdom and honourable behaviour. Regardless of positions taken, behaviour is important. If we see any one leader verbally abusing the opponent, stand on the side of the oppressed. Do not be swayed by rhetoric or nasty behaviour. Stand up for righteousness when we see one. Leaders are called to be examples. They need to be held to a high standard. Those in authority who rule well need to be constantly interceded for. Negotiators too need our prayers.